As you’re day-trippin’ around the region this summer, your taste buds will be in for a flavor adventure… Just in time for the best days of summer, our ‘Curds of Summer’ event kicks off in our Ellsworth and Comstock retail stores! We’ll be giving our store guests the opportunity to taste-test 10 new flavors of our all natural cheddar cheese curds over the coming 10 weeks. Every Friday there will be a new flavor to sample with a limited supply for purchase until the next week’s flavor hits the store shelves. We’re so grateful for the many loyal cheese curd fans who visit our stores each summer. You all take your jobs as curd aficionados seriously, too. It’s thanks to your discerning palates that our newest national retail flavor, Hot Buffalo, got its start, and how our exclusive in-store specialty flavors, like Pizza, Sour Cream and Onion, and Jalapeno, came to be. We can’t wait to hear your feedback on this summer’s flavors, which include Teriyaki and Horseradish and Chive, to name just a few. Plus, we’ve got a classic comeback for you… Many of you loved the Lemon Pepper Dill flavor and were disappointed when it wasn’t chosen as an exclusive in-store flavor. We’re bringing it back for another round of taste testing! Our Ellsworth and Comstock retail stores are open 9am – 6pm seven days a week. The cheese curd flavor of the week will be available starting each Friday morning throughout this seasonal campaign and available while supplies last. 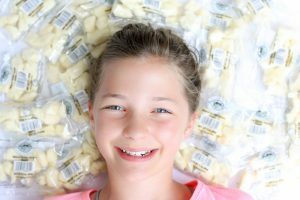 Our store staff will be listening to your feedback and critiques, and of course sales volume for each flavor will be evaluated when determining the future for each new cheese curd flavor — if you like it enough to buy it, then we know we’ve got a winner! We can’t wait to hear which flavors get your top votes!